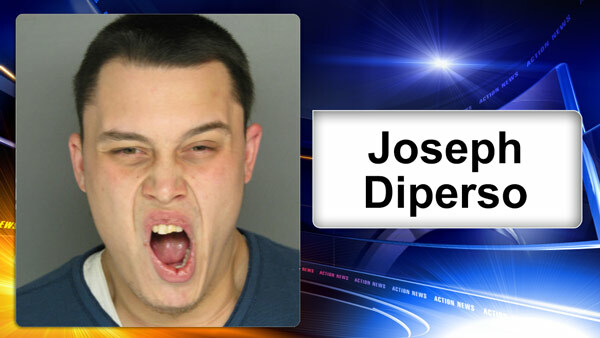 BENSALEM, Pa. (WPVI) -- Police say a 26-year-old man stole tools from a Bucks County Home Depot, punched an off-duty Philadelphia police officer, and escaped by holding onto the hood of a getaway car. The suspect is identified as Joseph Salvato Diperso of Philadelphia. Bensalem Township police say Diperso entered the Home Depot on Bristol Pike on Saturday, May 6, and selected a Dewalt Table Saw and two Dewalt Impact Drill Combo Kits. Police say he exited the store without paying for them, but was then confronted in the parking lot by an off-duty Philadelphia police officer. According to police, Diperso punched the officer and jumped onto the hood of a blue Honda Accord that was being driven by an accomplice. The vehicle fled the parking lot with Diperso on the hood. Police say Diperso was identified as the suspect because of previous retail thefts in neighboring towns. Diperso was taken into custody Thursday in the 3100 block of Brighton Street in Mayfair by federal marshals who knew of him through previous investigations. He has been charged with Retail Theft, Simple Assault, and Disorderly Conduct.